Sheila Stephen is a Bloomington, Ind. native who is hometown through and through. A former Miss Indiana (1987), Sheila has matured into a nationally recognized singer and songwriter. Her seasoned God given talent and positive attitude have brought her many awards in national talent contests as well as a talent award in the Miss America Pageant. Her songwriting achievements include "New Fool At An Old Game" a #1 Hit for Reba McEntire, a song, "Honky Tonk Leave Him Alone" recorded by Loretta Lynn, and a staff writing position at EMI Music Publishing in Nashville, TN. Stephen began performing at the tender age of 13 in talent shows at her middle school. At the age of 16, between her junior and senior years of high school, she joined the house band at The Red Barn Opry in Bloomfield and honed her skills there every Saturday night. Only escalating from there, her desire to bring music to people's lives has taken her down a very musical path. After graduating from high school, Sheila implored her mom, Linda, to help her put a band together. So in October of 1982 Sheila Stephen and "Shuffle Creek" performed for the first time in public at the Eastern Greene Co. Fish Fry. Since then her band has carried many names including "Shooting Star" and "Crazy Heart" which was the first song she ever recorded in Nashville, Tenn. Many band members have come and gone, but the constant force in her band was always the presence of her Dad, Tony, and Brother, Randy. Her father passed away in 2010 but her brother and sister-in-law Shannon, provide the back drop and support for Sheila's lead vocal with their honest background vocals today. Since that first performance in 1982, Sheila and her band have traveled all over the Midwest and beyond leaving behind a trail of adoring fans. Sheila is a world class entertainer! Above and beyond her natural talent for rendering songs, (from heartfelt conception through emotion filled conclusion) her live performance is unmatched. She has had the opportunity to open for many of the greatest country legends of all time including Mel Tillis, Waylon Jennings, George Strait, Diamond Rio, Randy Travis, Charley Pride and the late Tammy Wynette, and today's hottest artists, Easton Corbin, Jerrod Neimann, Brantley Gilbert, Kip Moore, and Casey James. In 1985, Sheila and her band entered The Wrangler Country Showdown, now known as the Colgate Country Showdown, which led to her co-writing the song, "New Fool at an Old Game". The song was written to provide extra points for original material in the contest, but went on to become Reba McEntire's 13th #1 hit in March of 1989. '85 was a big year for Stephen, as it was also the year she met legendary singer-songwriter Eddie Rabbitt. After meeting him at The Little Nashville Opry, Sheila was fortunate enough to appear with Rabbitt on his live shows through 1995, singing his #1 hit duet, "You and I", with him. It was Eddie Rabbitt who first encouraged Stephen to move to Nashville, Tenn. and pursue a career as a songwriter. In 1994, she did just that. Her days were spent beating the Music Row streets making connections with some of the Rows greatest songwriters. That eventually led her to EMI Music Publishing, the largest publisher in the world, where she signed her first deal as a songwriter. Sheila quickly became one of Nashville's busiest demo singers as well, doing demo work for all of the biggest publishers and writers in town. This caught the eye of the EMI production staff and they decided to take Stephen in the studio and cut sides on her to pitch to the major labels. 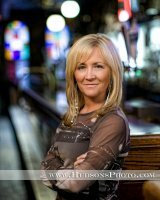 Sheila's stylistic rendering brought many of Nashville's industry insiders on to the Sheila Stephen bandwagon. All the while she would travel each weekend to perform Fridays and Saturdays at her Red Barn Jamboree music theater in Nashville, Ind. This was where she honed her skills and created a fan base rivaled by none. Although she is able to perform several different styles of music, her passion is "Traditional Country" music. But with the current direction of country music headed down the "pop" road, the recording industry wanted Sheila to compromise her style and become like the many female pop artists that now saturate country radio. Stephen wouldn't budge, her belief that there is still a desire by the fans to hear great country music wouldn't let her change her course. That led her back to Bloomington, Ind. where she is now host of the Midday Get-away, which includes the all-request lunch show The High Noon Saloon, weekdays on the area's #1 radio station, WHCC Hoosier Country 105. Stephen is also host to the Spectrum Award winning program "Coptalk" on WHCC, Friday afternoons. When Sheila isn't "on-air", often times you can find her handling Mistress of Ceremony duties at many charitable events around South-Central Indiana. Helping raise money for Jill's House, Toys for Tots, St. Jude, Bloomington Boys and Girls Club, and The March of Dimes. Stephen also works closely with the IU Athletics Department and the IU Womens' Basketball Program as host of in-game promotions. Sheila Stephen is a very busy woman. Radio personality, country singer, emcee, and most importantly mom to two young men: Garrett, 12 and Griffin, 10. When asked, she will tell you that being a mother is the most important thing she will ever do. And the most rewarding.